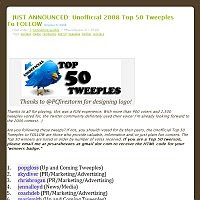 For those who are interested in how to find top Twitter users, I have created a collection of links to top lists of Twitter users according to several criteria. In the first place there are global rankings. 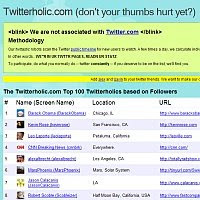 Twitterholic.com offers Top 100 lists based on Followers, Friends and Updates. 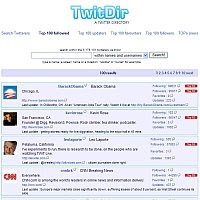 Twitdir presents Top 100 followed, Top 100 updaters, Top 100 favouriters and Top 100 followers lists. 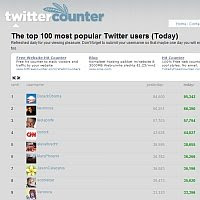 Twittercounter has a list called The top 100 most popular Twitter users. 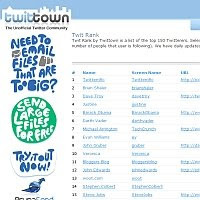 Twittown, the unofficial Twitter community, offers Top 150 followers, Top 150 updates and Top 150 following lists. 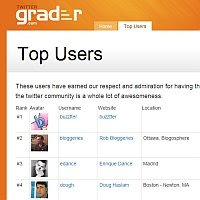 Twitter Grader gives you a grade based on the power of your Twitter profile. It also offers the list with the highest ranked Twitter users. 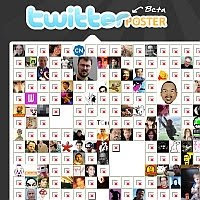 TwitterPoster is a visual application based on Twitter API. It provides a visual representation of the degree of influence of the Twitter users. It does not present a top list as such, but only top Twitter users are shown. There are also specialized rankings of Twitter users. 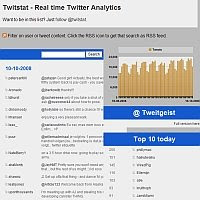 Twitstats offers various lists of Twitter users followed by @twitstat : Top 10 today, yesterday, most engaging, most social, happy people, funny people, angry people, tired people, most replies, perfect tweets. 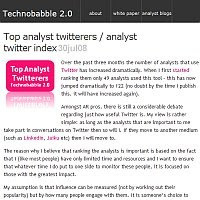 On the Technobabble blog, a post in July presented a ranking of analysts. 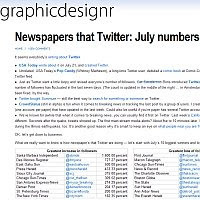 Rankings of American newspapers offering Twitter feeds can be found on the graphicdesigner blog. There is a July ranking and an August ranking. Finally you can always submit your own Twitter account for the Unofficial 2008 Top 50 Tweeples list. There is also a Dutch Twitter Top 30. Great job. I think this is a very insightful post. Thanks for sharing, its really helpful for me. Thank you for sharing this kind of good subject material on your web-site. I discovered it on the search engines. I will check back again whenever you publish extra aricles.